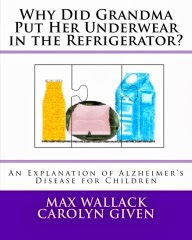 In January 2010, I first learned of the AlzheimersReadingRoom.com. The editor of that site, Bob DeMarco, had written an article about my donation to the Alzheimer’s Research Institute at Boston University. I emailed Bob, and a friendship was born. Emailing Bob was one of the best decisions I have ever made. It is amazing how much we have in common considering that we have never met, we live 1500 miles apart, and there is 45 years difference in age. I suspect that our common bond is that we think alike. Bob and I share knowing what life is like being a caregiver to an Alzheimer’s patient whom we love. We share a thirst for knowledge. 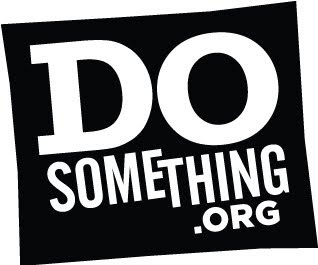 We both have a need to help others and provide information to help others. We both live our lives trying to make lemonade out of lemons. Bob DeMarco is one of the most intelligent people I have ever interacted with. I know that every word he says and every advice he offers needs my attention and contemplation. There is always some important life lesson waiting for me. Bob DeMarco was a Wall Street tycoon, a company CEO, and a College Professor. He walked away from that life six years ago to take care of his mom who has Alzheimer’s. Not only is he the exemplar of caregiving, he spends hours each day on the Alzheimer’s Reading Room sharing his expertise of personal experience as well as what he has learned from reading over 6000 scholarly articles. Often Bob tells me he can’t wait to see what I become in life. I couldn’t do any better than to live up to Bob’s expectations for me. I also know that Bob’s greatest contributions to society are yet to come. Someday, I will be a Geriatric Psychiatrist working with Alzheimer’s patients and perhaps doing research to find a cure for his horrific disease. Someday, Bob will be this country’s VOICE for Alzheimer’s patients and their caregivers. Perhaps, he already is. Today, two additional shipments of puzzles are being sent out. Veterans' homes in Alaska and Hawaii will be receiving these puzzles. Hopefully, the veterans there suffering from Alzheimer's disease will find enjoyment in doing these puzzles. Today, cartons of puzzles were packed to be shipped to four additional veterans' facilities that care for our veterans with Alzheimer's disease. Veterans at facilities in New York, California, Colorado, and Alabama will be receiving these puzzles. Fortunately, this time I was able to provide puzzles with 200 pieces or fewer, and most have large, easy-to-grasp pieces. There are an additional 8 packed cartons just sitting on my porch, already addressed, waiting for funding for shipping costs. Since March 8, I have spent every day in a hospital setting learning more about Alzheimer's disease as well as other neurological problems. I have had experiences ranging from being in an elevator with a patient having a sudden heart attack to visiting a very sad veteran's ward of advanced Alzheimer's patients. I found that most patients are eager to interact with young people, sometimes sharing their whole life story. Some are full of advice. I am convinced that interaction with a kind person can improve the life of every single one of the patients I have seen, even if only for a short time. Some of these older patients affectionately called me "Doogie". Being from another generation, it took me a few days to find out that they were referring to a TV show from the 80's. Tomorrow, I will be visiting some research laboratories where cutting edge research on Alzheimer's disease is happening. I am looking forward to learning a lot. Thanks to the grant from Stop & Shop, 10 more boxes of puzzles will be shipping out tomorrow.This includes boxes for nine Alzheimer’s Units in Veterans’ Homes. I find it particularly sad that these veterans who risked their lives and made huge sacrifices for our country, now cannot even remember the wonderful things they did to preserve our freedom! I want to supply puzzles for as many veterans’ Alzheimer’s facilities as possible. It is astounding how many such facilities there are! Today I spent five hours with a TV crew from BizKids. BizKids is a TV show on Public Television that encourages young people to start their own businesses, both for-profit and nonprofit. The crew of four took the time to try to capture the importance of the work that PuzzlesToRemember does. 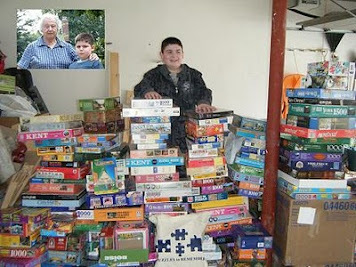 They videotaped the huge mountain of puzzles accumulating in my garage, awaiting funding for postage to ship them to Alzheimer’s patients who would really benefit from them. 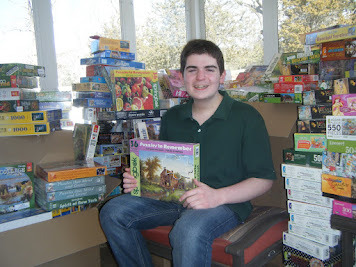 The Bizkids crew also filmed me collecting puzzles from one of my collection bins at the Weston Public Library. The Weston Library has always been very supportive of PuzzlesToRemember. It is one of my best collection locations. Today, 20 puzzles were waiting there when the Bidzkids crew and I arrived. I was proud to show the TV crew how the PuzzlesToRemember website has been recently accessed from Australia, Taiwan, the Phillipines, Italy, Thailand, Hong Kong, and other far away places. Alzheimer’s disease is a worldwide and growing epidemic. We need to invest in resources to find a cure. Meanwhile, we need to help those who are afflicted live their lives with dignity. Research shows strongly that creative endeavors, including jigsaw puzzles, can improve the quality of life of those affected by Alzheimer’s disease. For the past few days, I have been corresponding with a very nice lady, Joianne, from an Assisted Living Center in Texas. Joianne really understand how puzzles can spark the memories of Alzheimer’s patients. Joianne cares for eight Alzheimer’s patients. She told me a little about each one so I could try to pick out the puzzles that would be best. For instance, Joianne told me one patient is a retired science teacher who is still fascinated with dinosaurs, and she wanted to know if I had any dinosaur puzzles. Well, we were in luck. I do have dinosaur puzzles, but I hadn’t sent them out because I thought that most adults would consider them either subject matter for children or too frightening. This weekend, I will send that patient a great dinosaur puzzle. Another patient, with advanced dementia and a very short attention span, just became a great grandmother. I will be sending that patient a 6 piece puzzle of baby. A third patient, who was a world traveler to exotic places, will receive a puzzle of a European castle, while another patient who loves to garden, will have a puzzle of beautiful flowers. I hope these puzzles give a spark of recognition and a memory of happy times to these patients. Three more boxes of puzzles have been shipped out so far this week. 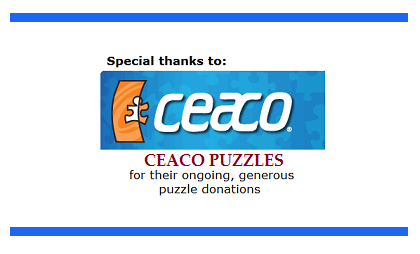 Thanks to Carole Larkin of Third Age Services, requests for puzzles are coming in frequently from Texas. I’m sure these puzzles will help many Alzheimer’s patients. I had an amazing day today. I had the opportunity to be in a hospital setting and be involved in memory clinic for veterans. I also learned about quite a number of different clinical trials and drug combinations that are being tested to help Alzheimer’s patients. It makes me feel hopeful because, if all this great work to find real help for Alzheimer’s patients is going on in just one hospital, then I know there must be thousands of smart researchers out there that are really trying to help. Today, Solomon Schechter School in Newton Massachusetts donated 200 puzzles to PuzzlesToRemember. The students at the school have been collecting puzzles for about two months leading up to today's donation. Every year on a Sunday in March, Solomon Schechter School celebrates "Mitzvah Sunday." On this day, the students all engage in some form of community service. The puzzles donated today will be sent to between 10 and 20 nursing facilities that care for Alzheimer's patients.